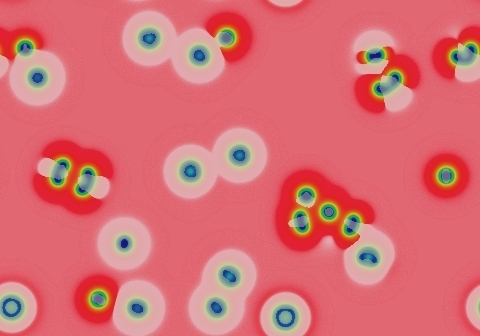 These images and movie demonstrate the behavior of the Gray-Scott reaction-diffusion system with σ=Du/Dv=2 and parameters F=0.0460, k=0.0650. Solitons in isolation multiply into 4 solitons (or sometimes 3, not seen here) which then become worms unless crowded out. Loops can also grow intact if undisturbed (bottom-left and bottom-center). The result is generally a field of worms and solitons. 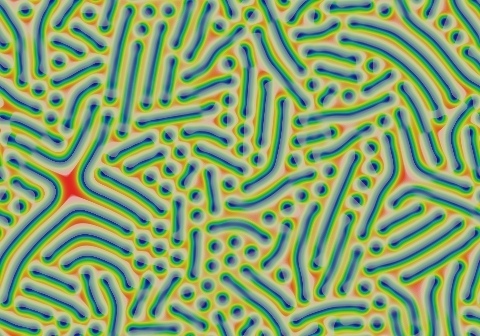 Sharp bends break and solitons can turn into worms if they have the space but otherwise, the demographics persist, with the final count of worms and solitons depending highly on the nature of the starting pattern. The 4-way bend at left slowly turns into two 3-way bends like the one on the right. Stability takes another 375,000 tu or more. Although mitosis does not last long at these parameter values, it is the most common form of growth just a bit to the east. 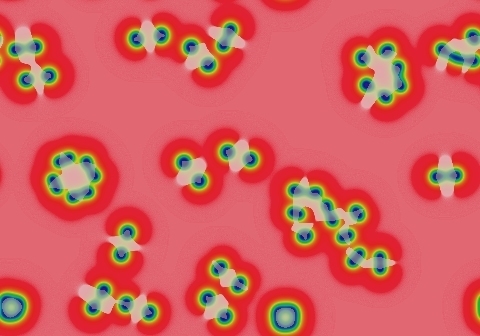 The eastern limit for mitosis at F=0.0460 is near k=0.0660.